Real Madrid forward Gareth Bale has returned to training ahead of Tuesday's Champions League quarter-final with Atletico Madrid after missing Saturday's 3-0 win over Eibar. Bale, 25, has been receiving treatment for a muscle problem which forced him to sit out a victory which left Real two points behind leaders Barcelona. 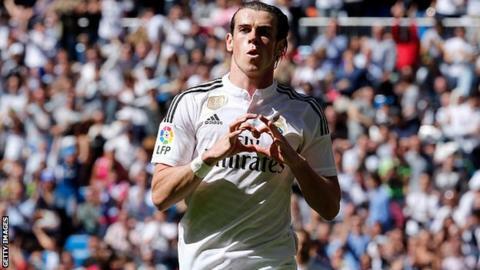 A statement on Real's website stated the Welshman had trained on Sunday. Real defeated Atletico 4-1 in Lisbon to win the Champions League last May. Since then Atletico have defeated Real twice in La Liga, including a resounding 4-0 win on Carlo Ancelotti's side's last visit to the Vicente Calderon Stadium on 7 February. "We head into the Champions League in good form and with the full squad available," said Ancelotti after Real's third straight La Liga win. "Our last result against Atletico gives us extra motivation. This will be a different game, a tough one, as it always is against Atletico. "We are motivated and we are going to give it our all." Defending La Liga champions Atletico Madrid are nine points behind leaders Barcelona after being held 2-2 at Malaga on Saturday.